Talk about a man who has his priorities straight. Former vice-president Joe Biden has joined Instagram, and his early follows include a select few of his most important friends and causes: the Obamas and Obama Foundation, the Biden Cancer Initiative, and, of course, Jeni’s Splendid Ice Creams and its founder. 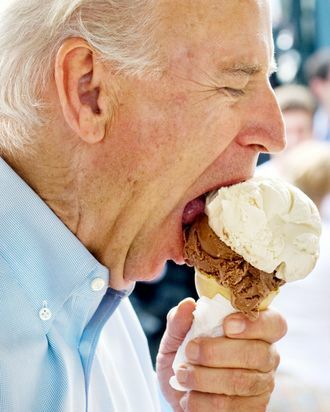 Ice cream is one of Biden’s most passionate causes, and he’s always been vocally pro-frozen-dairy, even once declaring “my name is Joe Biden and I love ice cream.” (Talk about a winning platform.) This is the gumption that Americans need, now that it will eventually get cold again and the nefarious anti-ice-cream lobby will pretend that “winter” is not a “good time” to eat ice cream.